Now we get to the Division 2 field events, and begin the throws contests. Ironwood Ridge have Seniors Parker Bayes and Justin McGrath as the top returners for both the Shot-Put and the Discus respectively. Parker Bayes placed 2nd in the Shot-Put behind Tyson Jones (Desert Edge, 2018) while McGrath placed 10th in the D2 Boys' Discus. Ranked right behind the both of them among D2 Boy returners is Uriel Hernandez (North Canyon, Sr.) placed 5th in last year's D2 Boys' Shot-Put competition. Meanwhile in the D2 Boys' Javelin competition, Jace Knutsen (Casteel, So.) 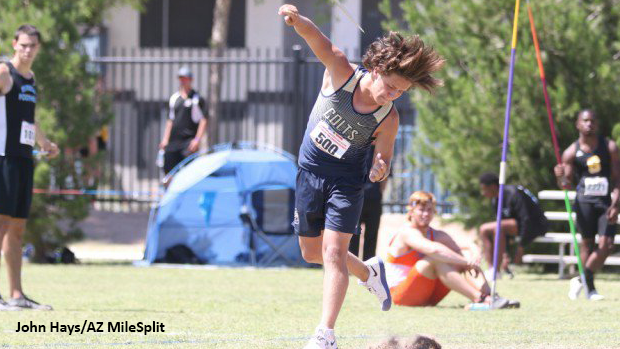 is the top returner among D2 Boys now that the Casteel Colts have been classified into Division 2. As a freshman, Knutsen placed 2nd in the D3 Boys' Javelin competition when he reached 160-1, a mark which ranks him 6th in the whole State among returners. Check out our full lists of the Top 100 Returning D2 Boy Throwers in each event.